Robert James Keeshan (June 27, 1927 – January 23, 2004) was an American television producer and actor. His first TV appearance was in 1948, when he played the voiceless, horn-honking Clarabell the Clown, a role he created and played for five years on the Howdy Doody Show. He achieved his greatest fame as the title character of the children's television program Captain Kangaroo, and became an icon for millions of baby boomers during its 30-year run on the Columbia Broadcasting System (CBS) from 1955 through 1984. The show won five Emmy Awards, three Gabriel Awards and three Peabody Awards. As his career developed Keeshan became an advocate, book author, lecturer, and lobbyist on behalf of childrens' issues. He was critical of modern TV programming, citing violence, and content. Whenever he lectured his topics included the importance of good parenting. In 1980, he was named TV Father of the Year. Keeshan was born in Long Island, but his family moved to Forest Hills, New York shortly after his birth. His immigrant father owned a grocery store and he had a younger sister and two older brothers. His mother died when Bob was only 15. At 18, he began working for NBC in their page program. A page was a low-level gopher, giving an individual an "in" at NBC, and giving them time to find where, if anywhere, they belonged at NBC. Before he could discover this for himself, World War II interrupted. Shortly before his 18th birthday, he joined the U.S. Marines, and underwent basic training. After the war ended he returned to NBC to finish his time as a page, working for Bob Smith during the day, and attending college at night with the goal of becoming a lawyer. After World War II network television programs for children were becoming popular. In 1948, when Howdy Doody premiered on NBC, Keeshan played "Clarabell the Clown," a silent Auguste clown who mainly communicated by honking horns attached to a belt around his waist (one of the horns meant "yes;" the other horn meant "no"). Clarabell often spritzed Buffalo Bob Smith with a seltzer bottle and played practical jokes. He gave up the role in 1952, and was replaced by another actor. In August 1953 Keeshan was back on the air on WABC-TV (New York City), doing a new children’s show, Time for Fun, playing the role of Corny the Clown, a clown who spoke. Later that same year, in addition to Time for Fun, he began Tinker's Workshop, a program aimed at preschoolers, where the 26 year old played the grandfatherly Tinker. Developing the ideas from Tinker's Workshop, Keeshan and long-time friend Jack Miller submitted the concept of Captain Kangaroo to the CBS network, which was searching for innovative new approaches to children's television programming. CBS approved the new show, and Keeshan starred as the title character of Captain Kangaroo when it premiered on CBS on October 3, 1955. Keeshan described his character as based on "the warm relationship between grandparents and children." The show was a great success, and he served as host for almost three decades; it ran until 1984. Frequently recurring characters included Mr. Green Jeans (played by Hugh "Lumpy" Brannum), and puppets such as "Bunny Rabbit" and "Mr. Moose." He also had a Saturday morning show called Mister Mayor during the 1964-65 season. As the easy-going Captain with his Kangaroo like pockets and his bushy mustache, Keeshan engaged young children fun approach to literature, science, and especially music. Children learned most easily, he argued, when information and knowledge became a source of delight. Keeshan's approach represented a rejection of pressures towards the increased commercialization of children's programming as well as a toning-down of the high volume, slapstick style associated with earlier kid show hosts, such as Pinky Lee, Soupy Sales, and Howdy Doody's Buffalo Bob. Unlike many other children's programs, Captain Kangaroo was not filmed before a studio audience and did not include children in its cast. Keeshan wanted nothing that would come between him and the children in his television audience and so spoke directly to the camera. He also personally supervised which commercials could air on the program, and promoted products, such as Play-Dough and Etch-a-Sketch, which he saw as facilitating creative play, while avoiding those he felt purely exploitative. He would regularly sit down and read an entire book, accompanied by nothing but music and illustrations. And every day he stressed the simple power of two "magic" phrases, the first being "Please" and the second being "Thank you." As his program's popularity grew, Keeshan took on an increasingly public role as an advocate for children, writing a regular column about children and television for McCall's magazine and occasional articles for Good Housekeeping, Parade, and other publications. He also wrote original children's books (as well as those tied to the Kangaroo program) and recorded a series of records designed to introduce children to classical and jazz music. He appeared at "tiny tot" concerts given by symphony orchestras in more than 50 cities, offering playful introductions to the musical instruments and the pleasure of good listening. "Captain Kangaroo" aired in the early mornings on CBS until 1985, when the network canceled the show to expand its morning news program. He met and married his wife, Jean Laurie, in 1950. They were married for forty years, until her death in 1990. Keeshan had two daughters, Laurie and Mave, and a son named Michael. He had six grandchildren. Bob Keeshan's grandson, Britton Keeshan, became the youngest person at the time to climb the Seven Summits when he summited Mount Everest in May 2004. He did so carrying photos of his grandfather, and buried a photo of the two of them at the summit of Everest. 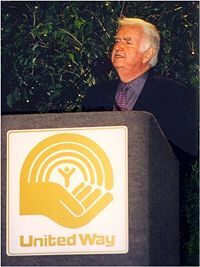 Bob Keeshan speaking at a United Way event in 1999. Bob Keeshan was a television pioneer and spent 40 years in television, all of them in children's programming. After Captain Kangaroo ended, Keeshan hosted 1985's CBS Storybreak, which featured animated versions of children's literature. Keeshan appeared in framing sequences for the animated stories, showcasing the book versions and suggesting similar books for the viewers to seek out. In 1987, Keeshan founded Corporate Family Solutions with former Tennessee Republican Governor Lamar Alexander. The company provided day-care programs to businesses. Keeshan lived on Melbury Road in Babylon Village, Long Island, New York before moving to spend the last 14 years of his life in Vermont, where he became a children's advocate as well as an author. His memoirs, entitled Good Morning, Captain, were published in 1995. He was a strong advocate against video game violence and took part in the congressional hearings in 1993. He later became an honorary member of Dartmouth College's Class of 1942. In his lifetime he was awarded no fewer than eight Honorary degrees and was named an Honorary Fellow by the American Academy of Pediatrics. In 1980 He was named TV father of the Year. In 1990 he was inducted into the Clown Hall of Fame. Keeshan died in Windsor, Vermont, on January 23, 2004, at 76 years old of natural causes. Keeshan, Robert. 1989. Growing Up Happy: Captain Kangaroo Tells Yesterday's Children how to Nurture Their Own. New York: Doubleday. ISBN 0385249098. Keeshan, Bob. 1991. "The Centennial Essay." American School Board Journal. 178 (4): 31-32,44. ISSN 0003-0953. Keeshan, Robert, and Diane Palmisciano. 1994. Family Fun Activity Book. Minneapolis, MN: Fairview Press. ISBN 0925190292. Keeshan, Robert, and Kyle Corkum. 1996. Books to Grow By. Minneapolis, MN: Fairview Press. ISBN 0925190837. Keeshan, Robert, and Kyle Corkum. 1996. Alligator in the Basement. Minneapolis, MN: Fairview Press. ISBN 092519090X. Keeshan, Robert, and Jane Maday. 1997. Itty Bitty Kitty. Minneapolis, MN: Fairview Press. ISBN 1577490177. Keeshan, Robert, and Chad Peterson. 1996. Hurry, Murry, hurry! Minneapolis, MN: Fairview Press. ISBN 0925190845. ↑ Corp Stories, Famous Marines. Retrieved October 13, 2008. ↑ New York Times, Bob Keeshan, Creator and Star of TV's "Captain Kangaroo," Is Dead at 76, New York Times. Retrieved October 13, 2008. ↑ 3.0 3.1 3.2 3.3 3.4 Museum TV, Bob Keeshan:U.S. Children's Television Performer. Retrieved October 13, 2008. ↑ Clown Ministry, Bob Keeshan; Captain Kangaroo, the first Clarabell the Clown. Retrieved October 13, 2008. ↑ Abroad View, Climbing High:An Interview with Britton Keeshan. Retrieved October 13, 2008. ↑ Brainy Quote, Bob Keeshan Quotes. Retrieved October 13, 2008. Keeshan, Robert, and Cathryn Long. 1996. Good Morning, Captain: 50 Wonderful Years with Bob Keeshan, TV's Captain Kangaroo. Minneapolis, MN: Fairview Press. ISBN 1577490002. Y.M.C.A. of the Great South Bay. 1990. 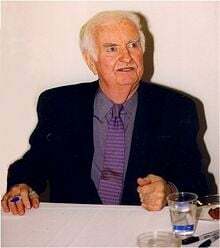 Bob Keeshan and Friends: A Journal Celebrating the Naming of the Bob Keeshan Children's Center of the Great South Bay Y.M.C.A., September 13, 1990. Bay Shore, NY: Great South Bay Y.M.C.A. OCLC 23260661. Bob Keeshan:U.S. Children's Television Performer Museum.tv. Poniewozik, James. 2004. O Captain, My Captain Time.com. Bob "Captain Kangaroo" Keeshan Findagrave.com. This page was last modified on 17 December 2016, at 22:20.